Vern’s is ordinarily, well, no frills. No shirt, no chip timing. Just a well-organized, small, community race organized by my running coach and named in honor of a friend of the race. Run the third Saturday of every month, Vern’s costs a dollar to enter (free for students and Georgetown Running Club members) and since they time it by hand, you save your bib and re-use it. The course–an out-and-back loop one direction, then an out-and-back the other way–runs three miles on the concrete sidewalk path through Berry Springs Park and Preserve, then the last .1 turns up a crushed granite trail to the finish line. Since it’s the same course every time, many people run it repeatedly to gauge their training and fitness levels from month to month. A couple of us ran it back in April, so when #100 rolled around in August, signing up was a no-brainer. 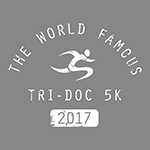 Especially since early registrants could get a tech shirt (race + shirt = $15) although runners could still register same-day for $1. This one would be chip-timed, plus Coach/Race Director Bill Schroeder had secured a huge list of sponsors, arranged for vendors to set up at the finish, and drummed up dozens of post-race raffle prizes for the celebration. Usually 150-250 people run this race on any given month. For #100, they ran out of bibs at 700 registrants! I finished solidly in the middle of the pack, slower than last time but a couple of minutes faster than the previous weekend on the beach. Considering the race started at 8 A.M. (it was 80* at 6:30 when I was driving to the race) so the first two miles were in more or less direct sun, plus I didn’t run all week since my left calf still bothered me, I’m okay with my time. After the race I wandered around the vendor area looking for the source of the popsicles I kept seeing in people’s hands. I failed at that, but then I ran into the Tri Doc and had him work on my calf for a while. Eventually I met up with the others and we headed over to the raffle area. So. Many. Treasures! Gift certificates from a couple of local running stores, free shoes from Brooks and Skechers, an entry to the Austin Marathon and a couple other races, gift certificates for massages and chiropractic treatments and all kinds of other running-related goodies like foam rollers and Clif Bars. I think I saw a big ice chest stuffed with BBQ equipment, a bucket with car-detailing stuff, and an enormous box of Fuel Belts. So enormous it hardly made a dent in the supply when each of the people who ran without bib numbers (since the race ran out!) got to grab one from the box. When the raffle started, Coach Bill rattled off bib numbers four or five at a time, and when those winners had picked their treasures (the free shoes and a couple of race entries went fast) the next five got to choose. It still took half an hour to give it all away, and at one point he just tossed a bunch of stuff–Fuel Belts, water bottles–into the crowd, up for grabs. I got a Fuel Belt as someone who registered early; a friend got a Rogue gift card, and another teammate picked out a Worm massage roller. It was a great way to celebrate race #100. Starting with #101, Vern’s returned to its no-frills roots with hand-timing and smaller crowds (I also ran its December Jingle Bell edition). So if you’re looking for an inexpensive way to gauge your fitness, come to Vern’s the third Saturday of every month, pay your dollar, and race!